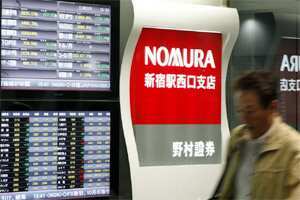 Tokyo: Japanese investment bank Nomura Holdings posted its first quarterly loss in 2-1/2 years on Tuesday amid a downturn in global financial markets and tripled its cost-cutting target to $1.2 billion in a setback to its overseas expansion plans. The debt crisis in Europe has ratcheted up pressure on Nomura to tap the brakes on a global growth drive that started with the acquisition of the Asian and European businesses of failed Wall Street bank Lehman Brothers in 2008. While Nomura did not give details of planned job cuts, chief financial officer Junko Nakagawa said that 60% of its cost savings would come from Europe, where it is losing money and has about 4,500 staff. “We expect the tough conditions to continue," Nakagawa told reporters. “These cuts are aimed at establishing a structure that can still respond even if the bad business environment remains intact for 18 months. Nomura posted a net loss of ¥46.1 billion ($591 million) for July-September, the fiscal second quarter, against a profit of ¥17.8 billion in April-June. The result was worse than the average ¥35.6 billion loss forecast by 4 analysts surveyed by Thomson Reuters. Nomura’s woes mirror troubles across the investment banking industry as turmoil in financial markets, triggered in large part by the debt crisis in Europe, and new regulations squeeze trading gains and depress fees. Nomura estimated its net country exposure in Europe at $3.55 billion. It said Italy accounted for about 80% of that and that most if its holdings were in government securities and in positions that matured in the next 5 months. Nomura is yet another addition to a lengthening list of Japanese firms that have posted poor quarterly results due to factors such as a strengthening yen, consumer gloom in the United States and Europe and supply-chain disruptions from the floods in Thailand. The list includes names such as Honda , Panasonic and Nintendo . Last week, Nomura’s chief rival in Japan, Daiwa Securities Group , posted its third straight quarterly loss and said it would cut more than 300 jobs in Asia and Europe in a setback for its overseas expansion plans. Among big Western investment banks, Goldman Sachs Group Inc posted its second quarterly loss as a public company and JPMorgan Chase & Co suffered a quarterly earnings drop of 25 percent. Nomura’s loss was its first January-March 2009, when it recorded a ¥215.8 billion loss, reflecting costs to integrate Lehman’s operations. For the full year to March 2012, Nomura is expected to post a net profit of ¥14.3 billion, according to the average estimate of 7 analysts prior to Tuesday’s results. Nomura does not provide an annual forecast. The results were released after the close of the Tokyo stock market. Nomura shares ended down 3.3% on the day, taking losses so far this year to 43%, compared with a 13.6% fall in the main stock index .